This first edition of the Postdoctoral & undergraduate Showcase has been a great success and the PDA has awarded Dr. Lindsey Brinton and her mentees, Mukul Govande and Madison Sirny for their research project entitled “Identifying synergism with FLT3 inhibition in Acute Myeloid Leukemia”, with a $500 donation to sponsor their shared research. Congratulations!!! 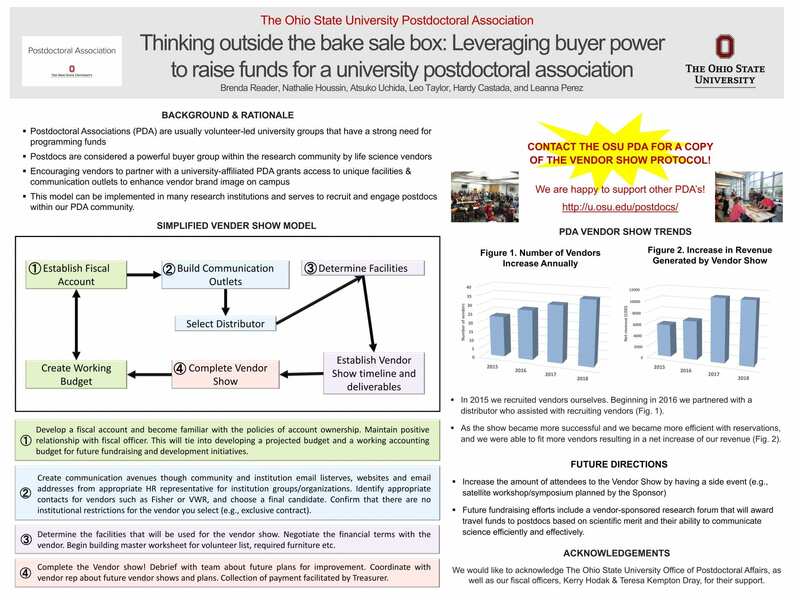 Leo and Hardy, the current co-chairs of the PDA policy and advocacy committee, presented the attached poster highlighting our fundraising initiative to the attendees at the NPA annual conference held in Orlando, FL (https://www.nationalpostdoc.org/page/2019AC/Meet-us-in-Orlando-for-the-2019-Annual-Conference.htm). Congratulations to the winners of the PDA Travel Awards for Spring 2019! All the recipients will receive $500 towards travel expenses for an upcoming research or a professional development conference. Congratulations to the winners of the PDA Travel Awards for Fall 2018! All the recipients will receive $500 towards travel expenses for an upcoming research or a professional development conference. Congratulations to the winners of the PDA Travel Awards for Spring 2018! Both recipients will receive $500 towards travel expenses for an upcoming research or professional development conference. First, we would like to acknowledge the support and dedication of Dr. Caroline Whitacre, Vice President of Research at The Ohio State University, with the 2017 Postdoctoral Advocate of the Year award. Dr. Whitacre’s support has been integral to the accomplishments of the PDA and the Postdoctoral Advisory Council – most notably, the establishment of the Office of Postdoctoral Affairs. The mission of this office is to promote career development and advance the quality of the training of postdocs. Furthermore, Dr. Whitacre has also been an advocate within OSU leadership for improving postdoctoral wages and benefits, opening doors for the PDA to initiate a dialog with the administration. We are sincerely grateful for her continued support, and wish her the best in retirement. The second recipient of the 2017 Postdoctoral Advocate of the Year award is Jeff Agnoli, Senior Staff Training and Development Specialist in the Office of Research. Jeff has been a dedicated supporter of postdocs throughout his career at Ohio State. Recognizing a need for greater postdoc representation on campus, he helped postdocs to establish the Postdoctoral Association in 2013, and has acted as a PDA advisor and a conduit with the Office of Research ever since. He was a founding member of the Postdoctoral Advisory Council, and one of the strongest proponents of the establishment of an Office of Postdoctoral Affairs. Jeff has been a mentor and helping hand to many postdocs on campus, and we are extremely grateful for his continued support and guidance. Noah Weisleder, associate professor of physiology and cell biology at The Ohio State University Wexner Medical Center, has been named director of Ohio State’s newly created Office of Postdoctoral Affairs, effective July 17, 2017. The office, a partnership between the Graduate School and the Office of Research, will serve as a central resource for Ohio State’s postdoctoral researchers. Members of the PDA and the PAC presented Brenda with the award on June 27th, 2017. Congratulations Brenda! 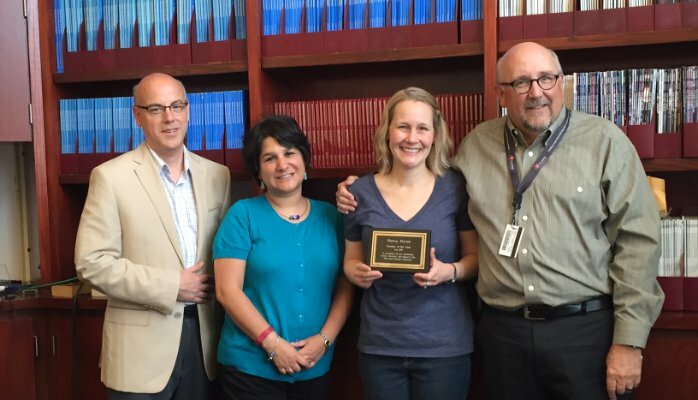 The Postdoctoral Advisory Council awarded Brenda Reader the 2017 Postdoc Service Award. This award is presented to a postdoctoral scholar who has shown outstanding service and advocacy for the postdoctoral community and the university. Dr. Reader demonstrated her dedicated service to the Postdoctoral Association as co-chair on the Policy and Advocacy committee 2015-2016 as well as taking on as co-chair of the PDA from 2016 to 2017. Her postdoctoral training started in 2013 and she became a postdoctoral fellow in the Molecular Mechanisms of Lung Inflammation training program in 2014 until finishing her training in 2017. After finishing her postdoctoral training, Dr. Reader became Manager of the Comprehensive Transplant Center Human Tissue Biorepository and Senior Research Associate in the College of Medicine. a. Details: Departs Columbus Fri, 4/21 8am. During the trip to D.C., there will be speakers and workshops on topics related to science, government, policy, and how to enact change. Dinner will be provided at hotel. The next day (Sat, 4/22), we will travel to the March, and depart from the March to Columbus by 8pm with arrival in Columbus by 2am. b. Prices: Our prices are fixed. After a certain date the prices will rise, so you will just need the special Sigma Xi promo code to get the reduced prices. 2. Budget Option: RISE Travel will provide a no frills option where you can ride the bus to D.C. the night be before the March and ride it back to Columbus later that evening. a. Pricing is $120 per person. We are gauging interest especially for the budget option. Please reply to Brenda (brenda.reader@osumc.edu) as soon as possible, regarding the option you might want to take. Thank you!!! The Ohio State Postdoctoral Association is pleased to announce Marcela Hernandez as the Postdoctoral Advocate of the Year. The Postdoctoral Association has made tremendous progress since its inception three years ago. During that time, an official charter was established, professional development events occur monthly, social events continue to build and reinforce our community, our fundraising efforts have been bolstered and the policy and advocacy committee are maintaining an open dialog with administrators regarding key postdoctoral issues. We maintain a website and LinkedIn group and are active on social media to communicate with our ~670 members. Our association is affiliated with the National Postdoctoral Association, for which every postdoc at Ohio State has a free membership. None of this would be possible without the enormous support of postdoctoral advocates at Ohio State. These are faculty and staff members who devote their time and their voice to push postdoctoral causes forward. One such individual was recently recognized by the PDA for her outstanding leadership and support – Marcela Hernandez, the Graduate & STEM Diversity Director for the College of Arts and Sciences. Marcela is also an integral member of the Postdoctoral Advisory Council (PAC) and has poured her heart into advocating for postdocs. Recently, she joined the National Postdoctoral Association, where she serves as a Diversity Officer. Marcela speaks for us at numerous events throughout the year and stands with us at many more. She is a pillar that many postdocs consult for help and guidance. Please join the PDA in thanking Marcela for all the work that she does to advance postdoctoral issues at Ohio State. Much of the work is done behind the scenes, and we are extremely grateful for her unwavering enthusiasm and steady leadership. 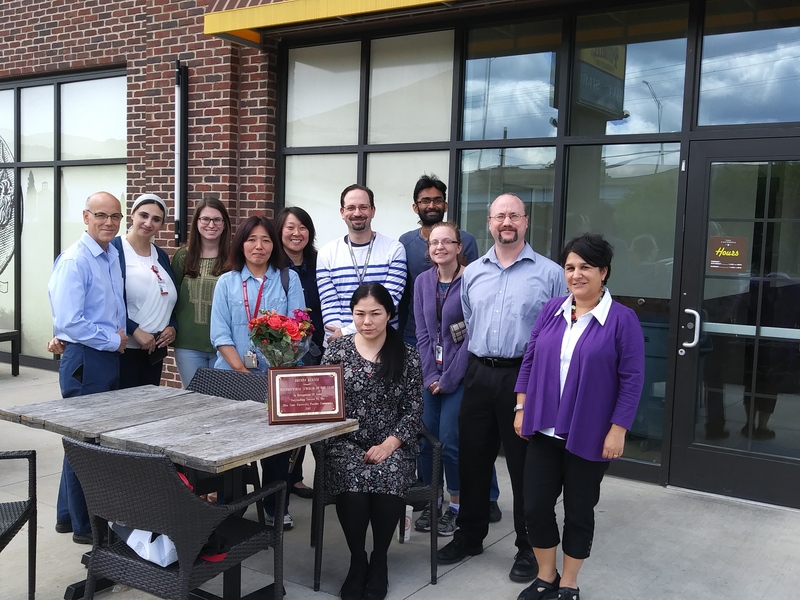 PAC representatives surprised Dr. Moran at her lab meeting on May 31st to give her the award. Left to Right: PAC members Jeff Agnoli and J. Marcela Hernandez, Nancy E. Moran, and Steven Clinton. The Postdoctoral Advisory Council (PAC) is pleased to announce FIC member Nancy E. Moran as the inaugural recipient of the annual Postdoc of the Year Award. This award is presented to a postdoc who has shown outstanding service, advocacy, and support to the postdoctoral community and/or the university. 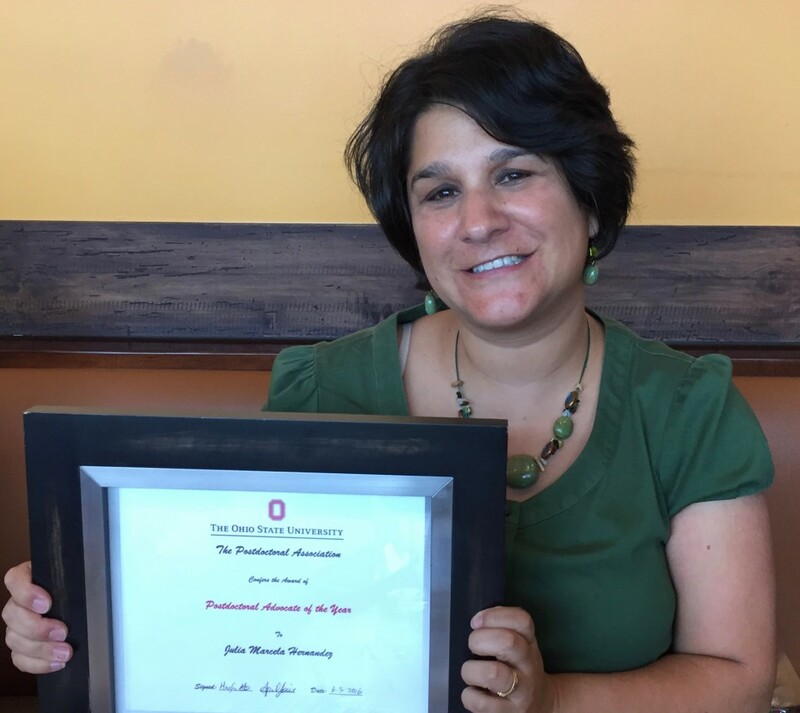 Dr. Moran has not only contributed to the leadership of the Ohio State Postdoctoral Association (PDA) as a former co-chair, but has been an outstanding advocate through her efforts as a member of the PDA’s Policy and Advocacy and Professional Development Committees. Much of her efforts centered around a proposal from the PDA to establish an Office of Postdoctoral Affairs and paid parental leave for postdocs, both proposals are being evaluated by the university leadership. After a 5-year position as a postdoctoral researcher and trainee of Dr. Steven Clinton in the Comprehensive Cancer Center, Dr. Moran will be moving to Baylor College of Medicine as a tenure-track Assistant Professor in the department of Pediatrics-Nutrition. Update from the Policy and Advocacy Committee: What are we doing to expand benefits? The Ohio State University PDA Policy and Advocacy Committee’s objective is to advocate for constructive changes that will improve the quality of postdoctoral training experiences. Our committee seeks to bridge the gap between postdoctoral scholars and university administration to promote policy changes that will address the issues that are common to postdocs. Last September, the PDA sent out a survey to Ohio State postdocs. The results of this survey indicated that many postdocs were unhappy with their benefits and that there was an urgent need for a clear and formal paid parental leave policy. Our committee, Policy and Advocacy, then thoroughly researched the case for paid parental leave for postdocs. We learned that paid parental leave was also on the minds of the Department of Labor, National Postdoc Association, the Federal Demonstration Partnership, and NIH, and that many postdocs at many other universities were actively advocating for change. The current official university policy Ohio State Paid Leave Policy 6.27 is often a source of confusion for postdocs and their mentors due to the policy’s failure to address ‘term’ employees, which is the classification of a postdoc. Even with the roll-out of the new HR website, there continues to be no HR resource that CLEARLY details postdoc parental leave benefit eligibility. The actual Ohio State parental leave policy is that postdoc researchers with 1 year of university employment are eligible for 12 weeks of unpaid, FMLA-protected leave. However, postdoc fellows, who are ineligible for sick leave or FMLA benefits, have no official parental leave at all. All postdocs are ineligible for paid vacation leave. To succeed in many advanced STEMM careers, a postdoctoral training period has become necessary. In the present day, the postdoctoral training period can last as long as the average US employee’s tenure in a workplace (~5 years; Bureau of Labor Statistics). This is a long time for postdocs to live with subpar benefits, especially when the postdoc training period coincides with the peak times of family formation. Indeed, the average age of Ohio State postdocs is 33.5 years old. To learn more, in December 2015, our committee held a focus group for Ohio State postdocs who were willing to talk about their parental leave experiences. We heard many stories of postdocs who had very stressful experiences with HR, their mentor, and their colleagues, all while trying to maintain work-life balance and a sense of financial security. For many, it was a complete surprise that paid parental leave was not a standard benefit for Ohio State postdocs. As we started to compare the benefits granted to different Ohio State employees and students, we were surprised to learn that, although postdoctoral trainees play critical and integral roles in the research and teaching missions of Ohio State, they are not granted the same parental leave benefits as other research team members (i.e., graduate students, technicians, etc. are all eligible for paid parental leave). Further, the current Ohio State policy creates situations where equivalent postdocs are granted unequal benefits. Faculty mentors either feel compelled to grant “off the books” paid parental leave, follow the policy of unpaid leave, or, tragically, pressure their trainees to not take leave. Because the future career of a postdoc is in the hands of their mentor, many postdocs are reluctant to speak up individually about these inequalities. Overall, these unequal benefits are not only a potential liability for faculty mentors and the university, but also profoundly affect postdocs’ morale, pursuit of work-life balance, and the quality and duration of postdoctoral training at Ohio State. Our mission has been to communicate these potential liabilities to Ohio State in order to provide our University opportunities for improvement and progress. In February of this year, the chair of the President and Provost’s Council on Women, Dr. Joanne Turner, invited our committee to present the case for paid parental leave for postdocs. One of our committee members, Dr. Nancy Moran, gave a compelling presentation that persuaded the PPCW to support the PDA in their goal to enact policy change. The PPCW relayed that they will also consider creating a task force of their members that would work to support our PDA in our shared goals. Our committee also sent a summary of the current Ohio State parental leave policy for postdocs, reasons for revising the current policy, and our recommendations to improve the current policy to the Provost on Tuesday, March 22, 2016. The Postdoc Advisory Council, who has been instrumental to supporting us in the development of this memo, plans to relay our memo to the college deans and to begin communication about our policy change initiative. Our committee is very pleased that Interim Provost McPheron has taken our request seriously and that he is considering the options. We hope that he and his team will be melding together a comprehensive plan that will provide a clear and formal paid parental leave policy that is equal to other Ohio State employees. We hope this plan will work to be a recruitment and retention tool rather than a liability. Our committee has come a long way since the inception of this policy change initiative, but we still have lots to do and a long way to go. If you would like to get involved with our committee or you have any questions, please feel free to contact either co-chairs of our committee Brenda Reader (Brenda.reader@osumc.edu) or Daniel Kiss (kiss.28@osu.edu). As The Ohio State University campus buzzes with the activity of a new academic year, postdocs in research groups across campus are celebrating National Postdoc Appreciation Week (NPAW), September 21st -25th, 2015. This will be the 6th annual NPAW, an event recognized by the passage of U.S. House Resolution 1545. To celebrate, Ohio State postdocs were invited by the Postdoc Advisory Council (an initiative that aims to serve postdoctoral scholars in the university while a formal Postdoctoral Affairs Office is being established) to have their professional portrait taken and will attend a “Happy Hour” on Wednesday the 23rd at Mad Mex (1542 N. High St.) from 5-6:30 PM, organized by the OSU Postdoctoral Association (PDA). Also, a professional development event will be offered on September 22nd on “Leadership and Talent Management” given by Prof. Lawrence Inks of the Fisher College of Business, in BRT Rm 105 from noon-1 PM. Currently there are 654 postdoctoral fellows and postdoctoral researchers on campus. Postdoctoral training is the next step after earning a PhD if the goal is to become an independent investigator. This career step was common in most STEM fields, but in recent years social sciences and humanities PhDs are starting to move to postdoctoral positions prior to obtaining permanent positions. During this time, postdoctoral scholars are fully engaged in the research and teaching missions of Ohio State. “I decided to do a postdoc so that I could get training and experience in new techniques and skill sets that I was not able to obtain during my graduate school education. I wanted the opportunity to start leading my own research in preparation for a career as a principal investigator and/or senior research scientist,” said Vanessa Varaljay, Postdoctoral Researcher in the Department of Microbiology. Postdoctoral scholars spend most of their time conducting research and disseminating findings. Depending on the training environment, they may also be involved in mentoring undergraduate and graduate students, management of research projects, and grant-writing. The Ohio State PDA was formed in January of 2013, with the support of the Life Sciences Network and the Office of Research, and is a registered charter of the National Postdoctoral Association (NPA), which means the Ohio State community has access to a free NPA membership and access to its resources. The PDA is a volunteer-run organization, all postdocs are members, and it benefits from the guidance of two staff members (Jeff Agnoli, Office of Research and Marcela Hernandez, Office of Recruitment and Diversity Services of the College of Arts and Sciences). The goals of the PDA are to advocate for postdocs, provide leadership and networking opportunities, and plan useful professional development activities for postdocs. Since its inception, the PDA has held numerous professional development events, many of which are archived on the PDA website, including sessions on mentoring, how to work with a professional recruiter, how to communicate research findings to the public, strategic planning for tenure-track success, entrepreneurship for scientists, and non-traditional careers in academia. Postdoc professional development events are targeted for postdocs but the entire campus community is welcome to attend. To facilitate professional networking, the PDA also hosts an annual picnic, monthly coffee breaks, and occasional evening events, and conducts a variety of fun fundraisers like bake sales and chili lunches to support these activities. The biggest fundraising event planned to date, a research vendor show, is just around the corner and promises to be fun and useful for postdocs. The Ohio State Postdoc Vendor Show will be held Oct 27th from 11 AM – 1 PM in Rm 115 of the Biomedical Research Tower, will feature 21 research product vendors, chances for selfies with Batman, lunch (first come, first served), and prizes. Postdocs and researchers are welcome to attend. “Involvement with the PDA has been a great experience, giving me an opportunity to interact with the entire postdoc community, which has been key in building a professional network and also in developing my leadership skills,” said Sayak Bhattacharya, a Postdoctoral Fellow in the College of Medicine’s Davis Heart & Lung Research Institute. All postdocs are encouraged to become active PDA members and take advantage of the professional development and leadership opportunities within the PDA. To learn more about the PDA, check out the website: http://u.osu.edu/postdocs/. Ohio State postdocs gathered to network on a sunny August Sunday at Fred Beekman Park for the 2015 PDA Annual Picnic.